“Ranil – Maithri administration, instead of managing the economy for the benefit of the people, continued with the old, gluttonous economy. The result of 10th February election is the people’s response to their idiotic moves. As such, the President or the Prime Minister can no longer fulfil the aspirations of the people. Only a people’s movement led by the JVP would be able to fulfil the aspirations the people expected with the 8th January change. We would assure that a political centre lead by the JVP would be built fulfil the aspirations of 8th January,” says the Leader of the JVP Anura Dissanayaka. 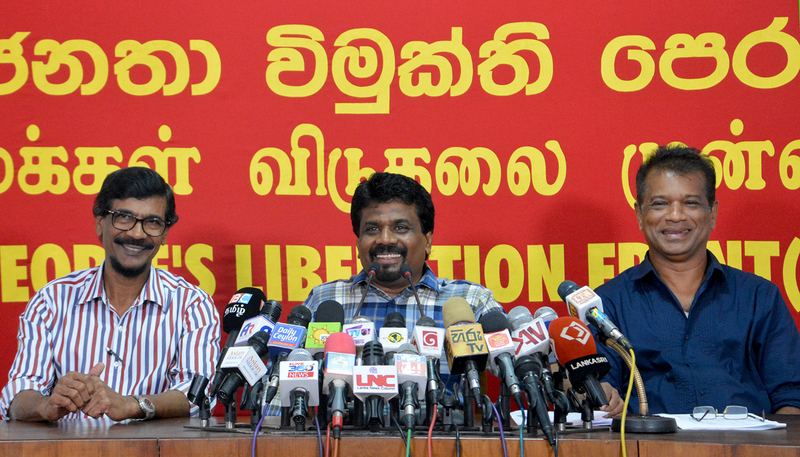 He said this speaking at a press conference held at the head office of the JVP at Pelawatta today (15th). The General Secretary of the JVP Tilvin Silva and the Member of the Political Bureau K.D. Lal Kantha were also present. Mr Dissanayaka said, “ According to the official records the number of votes the JVP has received is nearly 715,000. Also, the number of councillors is about 434. The number of seats the JVP had in LG councils was 74. As such, the number of JVP councillors has increased by 360. When compared with the general election in 2015 the number of votes for the JVP has increased by 170,000. The 715,000 votes we received are from those who accepted the programme and policies of the JVP. As a responsible political party, we have the responsibility to defend the trust of those who voted for us. Voters have various targets in casting their votes to different political parties. The voters who have voted for the JVP have done so to build an alternative socio-economic force. We pledge that we would make defend their trust and give value to their votes. We would never allow those who vote for us to regret or get frustrated that they had made a mistake. All our 434 councillors would act as genuine representatives of the people in a manner that would make those who voted them proud and we promise that we would manage our politics so that it would be easy for our councillors to serve the people. According to results, no political movement has exceeded 45% of votes. Also, no party can have power in 167 councils on its own. There have to be amalgamations to have power in such councils. As such, both parties have asked for the support of the JVP in these councils. There have been offers of making our comrades Chairmen of certain councils. However, the 715,000 voters who voted for us did not vote to form joint administrations; not to form alliances’. The task of our councillors within the councils and outside them is to serve the people as honest representatives of the people. We would assure that this would be carried out unabated. There is a state of disarray in the country at present. Prime Minister Ranil Wickremesinghe and President Maithripala Sirisena are responsible for this state. When the existing administration was toppled on 8th January 2015 the people had a political demand. It was not a personal need but the former administration was defeated to get a general need of the country fulfilled. This need was highlighted in the words ‘good governance’. The need was democracy, halting frauds, corruption and waste, punishing the corrupt, taking economy on a correct path and establishing a righteous political culture. However, the government from the time it was formed acted against the requirements of the people. Mr Maithripala Sirisena was having a fairy dream of protecting his chair at the next presidential election. Mr Ranil Wickremesinghe’s dream was to sit on the Presidential chair instead of the prime minister’s post at the next presidential election. Their personal needs came up. They are today are confronted with the consequences of their dreams. Instead of punishing fraudsters they were protected. Both Ranil and Maithri were taking steps to get support from fraudsters at the next presidential election instead of punishing them. Also, instead of managing the economy for the benefit of the people they continued with the old, gluttonous economy. The results of 10th February are the people’s response to their idiotic moves. As such, the President or the Prime Minister can no longer fulfil the aspirations of the people. Only a people’s movement led by the JVP would be able to fulfil the aspirations the people expected with the 8th January change. We would assure that a political centre lead by the JVP would be built. With the power struggle that has come up with the result of the LG election, there is no attention to the day to day lives of the people. There is no discussion regarding the economic crisis that has surfaced in the country. There is no attention to the issues of the farmer community, fishermen or the education sector. There is no discussion at all regarding abolishing the presidential system or establishing a new constitution. Nothing is discussed regarding minimizing frauds, corruption and waste or punishing the fraudsters. This is why President Maithripala Sirisena is attempting to form a government with Rajapaksa’s group and also having discussions with the UNP despite calling them fraudsters. The main intention of the discussions is to consolidate the power or to grab power.